This half day event will commence with a healthful Hayfield Manorbreakfast, followed by yoga session with Jean Noonan of Anam Solas Yoga,mindfulness and meditation with Michelle Hardwick of Release Peace, andfinishing with a pilates session with Julette Jones of Flex In The City. Thisfeel-fabulous event is being offered by all collaborating sponsors as a fun andactive way to kick start the New Year with positive intentions and actions. 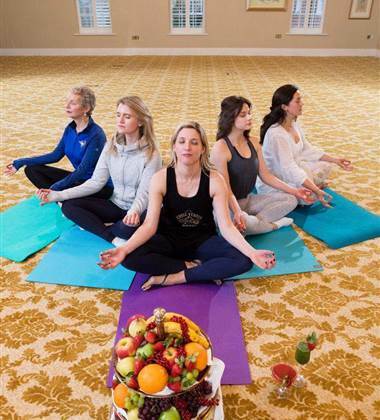 This health & wellness retreat is the second in a series ofevents that have undertaken by Karen Fleming and Emma Kenneally to raise bothfunds and awareness for DEBRA Ireland. All proceeds will go towards Karen &Emma’s imminent expedition this March, when they take on a notoriouslydifficult challenge through the Arctic Circle to raise vital funds for Irishpatients suffering with the debilitating effects of Epidermolysis Bullosa. Tickets for this half day ‘Health & Happiness’ event areavailable for purchase via Eventbrite at a cost of €59pp plus booking fees. With the support of their respective companies, Emma and Karenwill join a 20 strong group of Irish businesswomen as they set off next March toconquer the Arctic in a survival challenge involving a five-day trek 150 kmnorth of the Arctic Circle. Emma Kenneally concurred stating that “We were inspired to hear firsthand from Liz Collins, mother of 13 year-old Claudia who suffers from a severeform of EB, just how vital the funds raised by Debra Ireland are to all the familieswho are coping with EB and battling bandages on a daily basis”. Emma, Karen & their fellow businesswomen taking part in theArctic Challenge each have a remit to raise a minimum of €5,500. To this end,Emma and Karen have a number of fundraising initiatives on the horizon, thefirst of which, a screening of Christmas movie ‘Elf’ took place on the 16thof December at Great Southern Killarney, sponsored by the Hayfield FamilyCollection which also incorporates Hayfield Manor in Cork, Great SouthernKillarney and Killarney Royal hotels.